Jacksonville rallies for Black transwomen, demands police accountability | Fight Back! Jacksonville, FL - About 150 people came out to a Trans Lives Matter rally, June 27, in front of Jacksonville courthouse to demand justice. The event was sponsored by many organizations including Jacksonville Community Action Committee, Coalition for Consent, Jacksonville Transgender Action Committee, Equality Florida, and Transgender Awareness Project. This rally was to honor the lives of the three black transgender women murdered here in Jacksonville. Just this week a black transgender woman, Cathalina Christina James, was murdered in Jacksonville, which makes this the third transgender women to be killed, following Celine Walker and Antash’a English. The Jacksonville Sheriff’s Office (JSO) believes that none of the murders are connected in any way, but some community members disagree. This year alone, 13 transgender people have been murdered in the U.S., with 23% of those killed occurring in Jacksonville. Kittle told the crowd, “We need to get rid of the illusion that there is a force that equally protects all of us. We need to keep building our communities and hold the JSO accountable.” Kittle and other speakers talked about why it’s necessary for the Jacksonville community, especially the Black community, to fight for community control of the police, making sure misgendering doesn’t persist along the JSO and that police find the possible serial killer attacking the transgender community. “Revolutionary women of color such as Sylvia Rivera and Marsha P. Johnson fought the battles and paved the way for gay and trans liberation, and are so often left out of the narrative by rainbow capitalism, but the fight for trans liberation has always been connected to the fight for police accountability,” stated Elias Joseph, a local Syrian trans activist and community organizer. 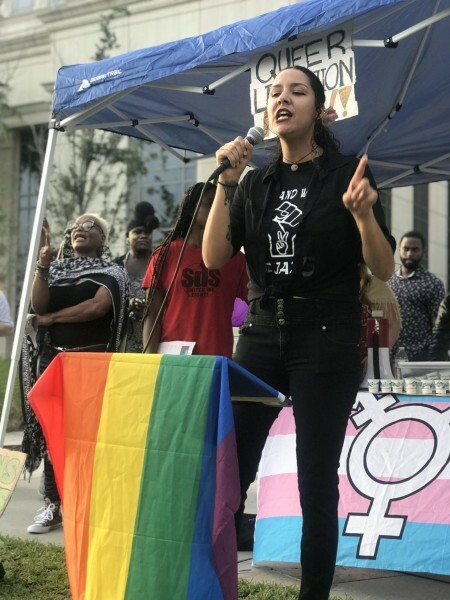 Many are also calling for the resignation of Jacksonville’s Sheriff Mike Williams, who has yet to make a statement on the murders of the black transwomen, along with Mayor Lenny Curry, whose office has been silent around these deaths. Protesters vowed to keep up the fight until justice is won.